$4,800 per year, per client relationship. Over the past few decades, there has been an insurmountable shift in the business of financial advice to move away from transaction-oriented commission compensation to asset-based fees. At face value, this is a good thing. Removing the financial incentive for brokers and advisors to actively churn client accounts is a tremendous step in the right direction. However, one falsehood of the financial services industry remains: that the relative value of an investor’s portfolio ought to determine the fees and charges the investor is subject to for the delivery of financial advice. As a result of this falsehood, the powerful economies of scale that are rightfully due to the investors are instead taken to generate unconscionable profit margins for mutual fund companies, brokerage firms and investment advisors. We know from experience that it does not cost a firm more to manage a portfolio of $1,000,000 than a portfolio of $500,000; it does not cost more to manage $5,000,000 than $1,000,000. Why, then, should clients pay more to receive the same services? We intend to change that, at least for our own clients. Rather than arbitrarily deriving our compensation from the value of an investor’s portfolio, we have built a retainer fee structure around the services that we provide. Bason Asset Management firmly believes that a flat annual retainer fee is a more appropriate compensation method for a Registered Investment Advisor than the traditional percentage of assets under management. Our services do not vary appreciably between clients with larger or smaller portfolios, so our fee structure reflects this. This fee ($4,800 per year) is based on our costs and reasonable compensation for a professional service provider. The difference between a typical 1% investment advisory fee and a flat annual retainer fee over a long period of time can be overwhelming. If we assume a 7% return on a portfolio, a 1% advisory fee can cost an investor with a $1,000,000 portfolio over $500,000 in lost returns over twenty years when compared to a flat annual retainer fee. An investor starting with a $1,000,000 account investing over 20 years will pay advisory fees to the tune of $400,000 in this scenario. This compares with the $96,000 this investor could have paid under a flat fee structure. 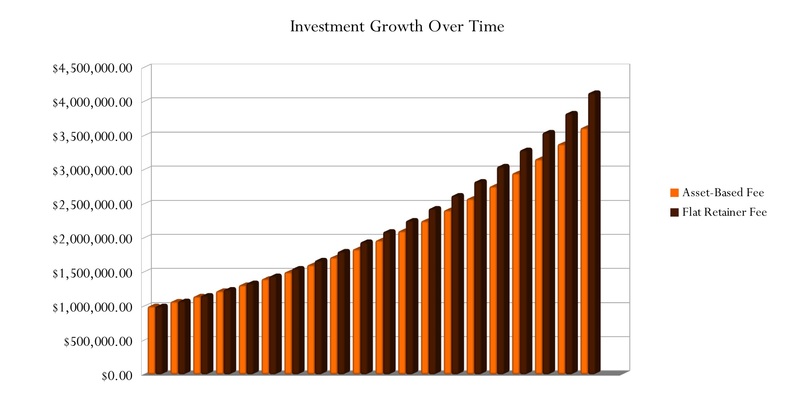 The $400,000 figure equates to roughly 15% of the investor’s long-term returns.